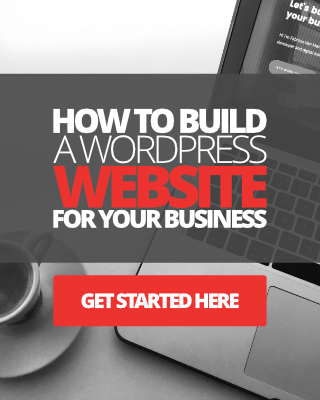 Do you want to boost your blog traffic, increase social shares and comments, skyrocket your email opt-ins, and boost your conversions, and, really help stamp some authority on your blog? What a silly question, heck, of course, you do. Well, I don’t need to keep reminding you that your blog content has to be “above and beyond awesome” to get all of those things I mentioned above. And don’t worry, I’m not about to lecture you on how to create great blog content. What I do want to share with you here today, however, is some tips and advice on creating one very specific type of content for your blog that will seriously attract all of the things I mentioned above and more. The type of content I’m talking about is called an “expert roundup post”. What is an expert roundup post? An expert roundup post is an article that is made up of let’s say 80% content created by bloggers and experts that you invite, and 20% created by you. Here are some perfect examples of great expert roundup posts some bloggers have created. Creating an expert roundup post requires a lot of research, planning, and preparation, and the correct execution to make it successful, even though most of the content will probably come from those you invite to contribute to your expert roundup article. Creating expert roundup blog posts can be extremely rewarding, as I said earlier, they can attract a lot of traffic, social media shares, and even some backlinks. 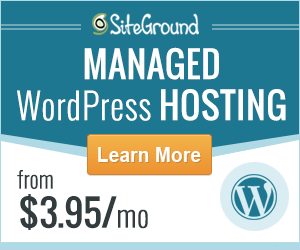 Help you to boost your blog authority. 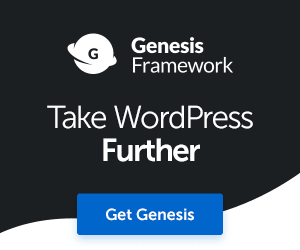 Help you to connect with top influencers, including bloggers and marketers in your industry. Attract a ton of high-quality social shares, because almost everyone who contributes to your expert roundup posts will want to share your post with their own social media followers. OK, so you’re ready to start creating your own expert roundup article. How do you do it? That’s what we’re going to look at next, so sit tight and let’s get on with it. How does an expert roundup post work? Well, in a nutshell, you ask a specific and relevant question related to a topic in your niche or industry to a targeted group of people i.e. bloggers, leaders, marketers, etc. Your question can be added in an email invite along with some words explaining why you are inviting a specific person to participate in your expert post. If the individual accepts your invite, he or she will provide you with answers to your question(s) which you can use to build up your roundup post. So what you want to do after deciding who you want to target, is to figure out what question you want to ask. When I carried out my last expert roundup post, I thought about the types of problems some of my readers were having. I wanted to ask a question that could provide value in the form of answers to those problems. What’s your most effective method for promoting a brand new blog post? What’s the biggest mistake you made when starting your online business, and what have you learned from it? What problems are you currently facing when building your email list? What’s the one tip you would give to someone new to affiliate marketing? Once again, these are just examples. Once you’ve figured out what type of question you want to ask, you can move to the next step of preparing your question for emailing. Create An Expert Roundup Post, Step Two: Getting prepared. Before you start emailing your question or questions out to anyone, it’s very important to do some preparation work first. First, you’ll need to make a list of as many bloggers, industry experts, and influencers in your niche as you can. These will be all of the folks you may want to invite to participate in your roundup post. This process is much simpler to do if you’ve already established a connection with some bloggers in your industry. The key to creating a successful roundup post is to reach out to some top-level influencers in your industry. I’ve found, from my own experiences, that the very high-level bloggers, entrepreneurs, and influencers will almost never have time to participate in roundup posts, but, that doesn’t mean you shouldn’t at least invite them. When contacting anyone, consider first creating a database list of who you made contact with, when, how, and when they responded to your email invitation. This way you can keep on top of things and if you need to send follow-up emails to those who haven’t yet responded, or to those who are interested but haven’t gotten back to you with a final response, it will be easier for you to see from your list. Of course, this can only work if you keep your database updated as soon as you get new information. Below is a screengrab of the simple email outreach campaign database I created for my last expert roundup post. I use “Numbers” for the Mac, but you can create an email outreach campaign database using Excel for Windows or any other spreadsheet software. Google Docs is another great tool you can use to create a worksheet of contacts. The other great thing about keeping your expert roundup post contacts organized and updated is that if you need to use them again in the future for another roundup article, the whole process will be easier and you can save a lot of time too. Create An Expert Roundup Post Step Three: Sending email invitations with your question(s). So, with your email contact list ready, you can now start sending your expert roundup invites. Before you go off to do this, you first have to make sure your email campaign is compelling enough for people to read it and take action. One thing you have to remember at all times when emailing other bloggers and influencers is that a lot of these folks will already be receiving a ton of emails every single day. You have to appreciate that their time is extremely valuable. So, with that said, you want to make sure your outreach email doesn’t take them forever to read or waste their time. It is always best to keep your emails short, simple to read, and to the point. In addition, I would also suggest you set a deadline date for people to respond, so at least they can add it to their calendars or have the date stamped in their minds if they’re at all interested in participating. From previous experiences, I think 2 to 3 weeks is ample enough time to give someone to respond to an expert roundup invitation. So, here’s a summary of what you need to do. Create a compelling email campaign with your question. Keep the email short and concise. Set a deadline date for folks to send in their contributions, answers or responses. Send emails and update your spreadsheets accordingly. Create An Expert Roundup Post, Step Four: Constructing your roundup article. Now, like I said at the start, 80% of the content will be contributed by your participants, the other 20% by you. As you begin to receive email responses from the folks you have invited, you can begin to add their contributions to your roundup post, building it up slowly. Again, don’t forget to update your spreadsheets when doing this. Start the post with a brief introduction, followed by the question you asked a group of experts (your participants). When adding your participant’s responses to your post, start by creating a short title containing the contributor’s name with a link to their website or social media profile, including a small photo (optional). See image below for an example of this. Create An Expert Roundup Post, Step Five: Finalising, publishing and promoting your expert roundup post. The length of your roundup article really depends on how many people you’ve invited to participate, and, of course, how many people actually respond, and how much valuable content they provide in their response. Once the deadline is reached and you’ve finished putting together your roundup post, and once you’ve edited and proofread it a hundred times over, you’re then ready to hit that publish button. Promoting your post is where the real fun begins. Not only will you be promoting the post, but potentially everyone who has made a contribution to your roundup post will also want to promote it as well. To make sure this happens properly, construct a short email to let your participants know that your expert roundup post has been published. Note: If you need some tips on how to promote your post for maximum exposure, traffic, comments and social shares, learn from 23 top blogging experts here. 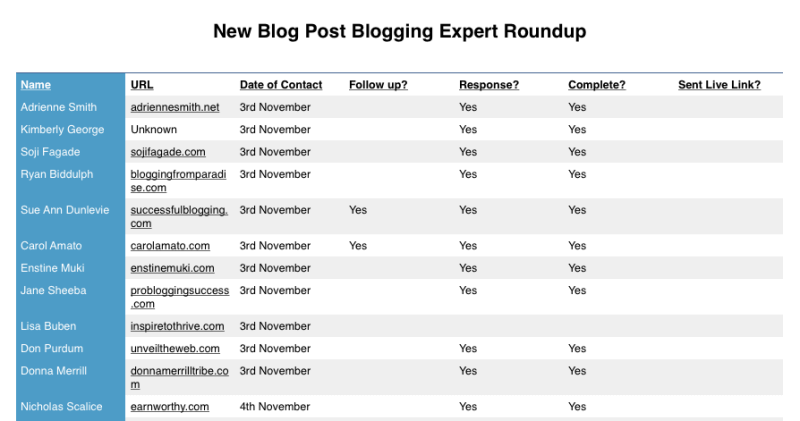 When done correctly, expert round-up posts can really help you and your blog stand out. 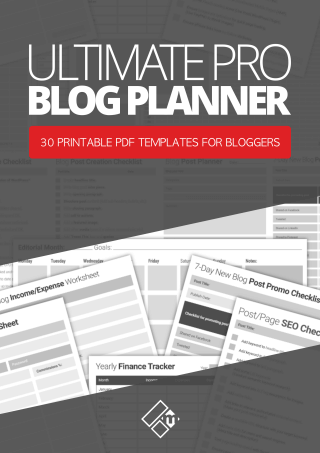 Above all else, they can provide a ton of value to your readers and blog followers. Yes, they do take time to put together, but they’re so worth your time folks. To make your first expert roundup post even more valuable and memorable, you could even consider adding some bonus content, otherwise known as content upgrades. I talked about content upgrades in this post. OK, that’s it, I want to wish you the very best of luck. This one was really interesting to me because I’ve yet to conduct any sort of expert roundup post. Loved that you actually went through and showed us exactly what you did, there were ideas here that I would have never of thought of. I especially like the idea of keeping a spreadsheet to keep things organized. That’s one area I definitely need to improve on in all aspects of my business so no doubt I’m going to end up using that one if I ever do my own expert roundup… which you’ll definitely be part of if that time ever comes. Fabrizio, thanks so much for including my roundup in your post – you’ve put together a great primer for anyone wanting to get started with these types of posts. A great way to take these further is to repurpose the content into an infographic and offer another blog the opportunity to host it. I tried this with TweakYourBiz.com and get an extra 30,000+ views & most of the participants shared it the second time. Loving your blog’s design btw! Hey Adam, great to see you here and thanks! Wow that’s amazing mate, and such a great idea too, I’ll definitely try that one out. I thought about repurposing and creating my last roundup into an eBook as well. An eBook could work especially well too. You could use a content upgrade style strategy for this. So let’s say you do a group interview on straight up blogging strategies, you could repurpose that into an eBook but add a resources section or something to add value to the ebook so it’s more than just a repurposed post. Then publish the original post with a content upgrade. Repurpose that into an infographic and link back to your original post, then repurpose the post into a Slideshare presentation with another link back to the original post. The links back to the original would need to be pretty strong calls to action but with the help of influencers & the site you publish the infographic on & Slideshare, it could drive a nice amount of traffic back to the original. Put a targeted popover on the post that is tailored to the content upgrade offering set to exit intent and you could be looking at some pretty sweet conversions.